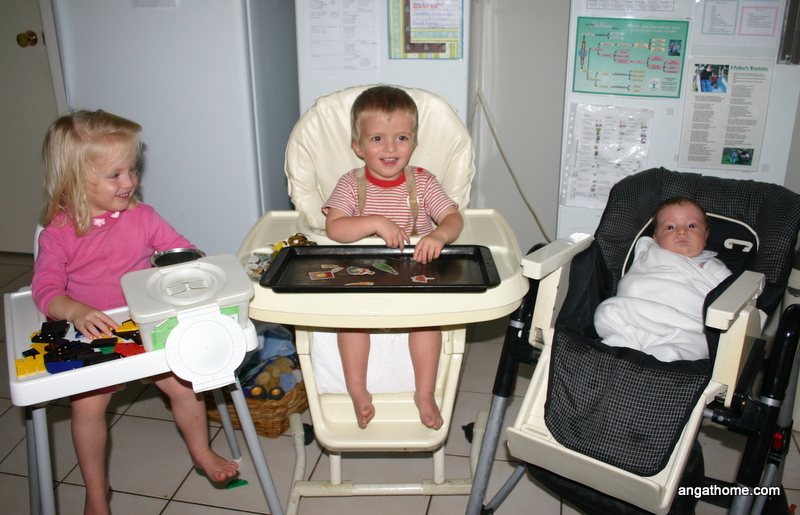 Highchair time at our house – 3 in a row! I like to cook for fun. It’s enjoyable to potter around testing new recipes and trying them out on friends and family. I don’t so much enjoy having to get dinner on the table at short notice, with a bunch of hungry, cranky children getting on each other’s nerves as we battle through “arsenic hour” as I have heard it termed. So, how do I get a nutritious and delicious meal on the table on time every day that will please everyone from the baby, right up to Dad? Well, to tell the truth, that’s almost impossible – with 8 people sharing a meal on a nightly basis, someone is bound to disagree with the delicious part! However, let’s concentrate on the nutritious and “on time” part. We haven’t eaten cereal for dinner yet, although baked beans on toast is the equivalent as far as I’m concerned and we’ve had that a few times! There are some practical ways that I have gone about structuring my days and time so as to make this touchy time of the day run smoothly and happily for all of us and still have a nice meal on the table. Strategies have changed over time, depending on the ages of the children and what time my husband is due home, but here are some of the ways we have structured the late afternoon period that have worked for us in the past. Flexible routine. Having a routine running throughout the day makes a big difference at the end of the afternoon. If the children have spent too much time together, especially unstructured time, they will invariably be at each other by the end of the day. A good balance of time with me, with each other, time alone and indoor and outdoor time, all work together for a smooth afternoon. More on routines here. Feeding toddlers and/or babies early. I prefer it when we all eat together, but there are seasons when that is just not viable. The was a time when 4.45pm was like a “switch” for my toddlers. Happy before, exceedingly cranky afterwards. My options were either to feed them a large afternoon tea earlier (and have problems at dinner with them not wanting to eat well) or to simply give them their main meal earlier. When the rest of the family came to the table they were given some finger food or perhaps fruit or dessert to enjoy with us before moving on to a highchair activity while we finished up. This allowed them to still be a part of the family, I could focus on feeding them and training table manners away from the family mealtime and enjoy my meal relatively peacefully later on. Baths. Everyone preschool aged and under (i.e. all those who require my assistance during bath time) are all bathed around 4.30pm rather than after dinner when everyone is tired and likely to be fractious and uncooperative. Bath time is then an enjoyable experience for all and bedtimes are not held up if I am caught up feeding a baby or dealing with unexpected circumstances. Table activities. 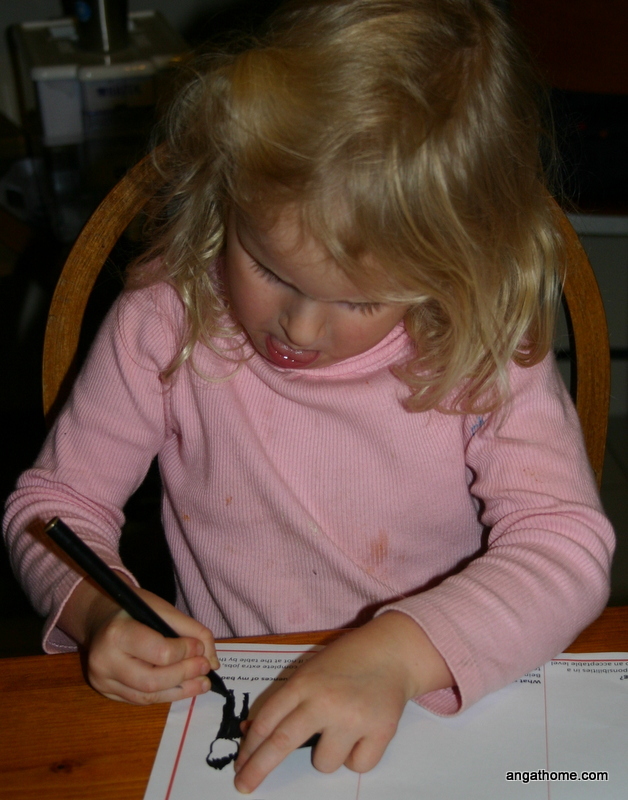 For around half an hour before dinner, all the children do highchair activities (some ideas here, here, here and here ), table activities (some ideas here, here and here), mat time (some ideas here, here and here), puzzles or books. There is nobody roving about getting into trouble and plenty of interesting activities to do. I am then free to get the last-minute dinner preparations done. Sibling time. Sometimes the youngest children are unable to play independently at this time and need someone with them. This is when I assign an older sibling to spend some time with the little ones, reading them a story, playing on the mat with them, helping them with a simple puzzle or something similar. 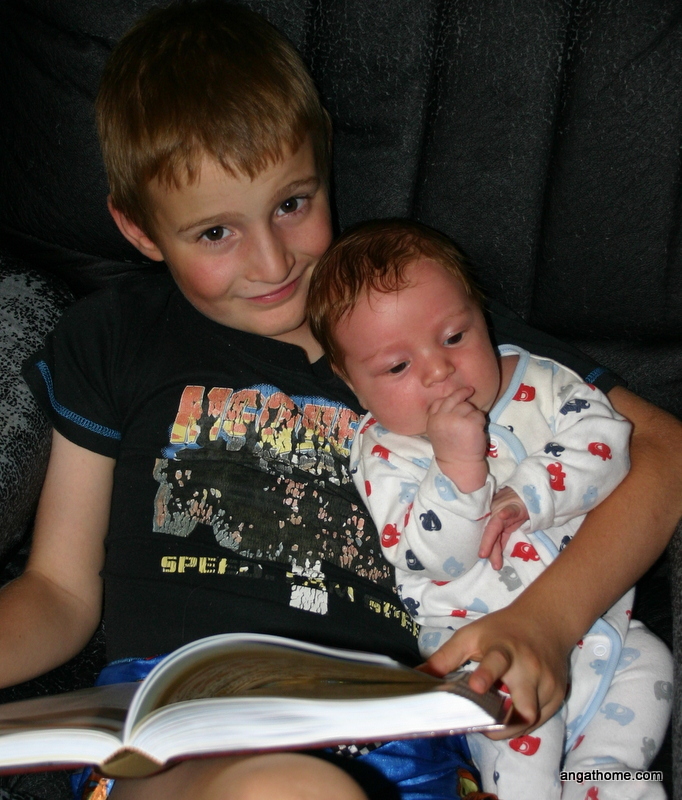 The eldest enjoy the responsibility and it helps build positive sibling relationships. They do not resent this time because it is not something they are required to do throughout the day in a random way or for large blocks of time. Menu plan. Having a plan of which meals I will be making throughout the week is so important. Getting to dinner time and realising the meat is still in the freezer and trying to come up with plan B on the spur of the moment is never a great way to have a smooth afternoon period. Knowing what I am going to cook means I am prepared and can plan ahead, often using a few spare minutes here and there throughout the day to get some prep work towards dinner done. More on menu planning here. Night time preparation. While I am caring for babies, homeschooling and looking after several older siblings, trying to fit cooking in during the day can be very difficult. There are usually several months after the birth of a new child when I do all my meal preparation in the evenings. And I do mean all. I set out breakfast dishes and ingredients and cut up fruit, bake or pull out frozen or pantry snacks for morning tea. I do all the peeling, chopping, grating, salad making or whatever other prep is needed for lunch. Dinner meals are pulled out of the freezer, ingredients are put in the slow cooker and veggies are washed and chopped – even to the point of putting the veggies in a saucepan of water in the fridge. It sounds over the top but, especially with the twins, I just didn’t have a moment to spare during the day. Being able to pull the crock pot out of the fridge and flick it on at morning tea time, knowing there would be a hot meal ready by dinner, was such a blessing. Even when things were going pear-shaped, I could throw a saucepan full of veggies on the stove as I walked past. 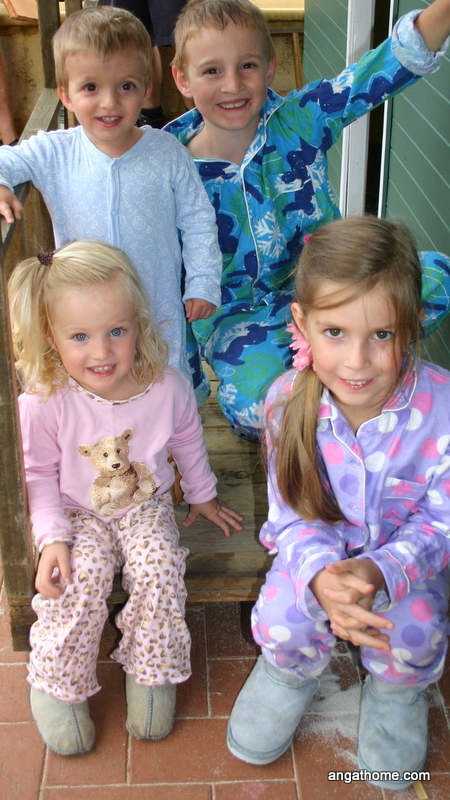 Older children could set out prepared lunch or morning tea for everyone to help themselves if I was caught up feeding. At other times, I didn’t have to cook at night, I used the time immediately after breakfast to get the dinner made. Everyone is fresh in the morning and it was a good time to get the household chores and dinner preparations under way. Now that I have older children to homeschool, this time is used for our more difficult subjects that require the most concentration, so dinner making is not a possibility. Instant meals. For days when, menu plan or not, I have nothing ready for dinner, all supplies are frozen solid and my mind is blank, I am endeavouring to build up a collection of meals that are very quick and easy, that use ingredients I can keep on hand in the pantry or freezer without them going off and throw together in a matter of minutes. My rice cooker fried rice is a family favourite and assuming I have prepared my ingredients earlier, can be thrown together in literally 3 minutes. I haven’t timed it yet but I’m going to!! Ideas for nearly instant meals and pantry mixes are here and here. Shopping lists. As an extra tip, shopping lists are a must to make life run smoothly around here. I have a shopping list pad with a magnet back that lives on the fridge. As I notice we are running low on an item, I immediately jot it down on the list. When I make out the menu for the following week, or check through the monthly menu, I add the items we will need to the shopping list too, after checking through the pantry first to see if we have what I think we have. It stops the random buying of stuff we don’t need and the irritating need to continually run to the shops to pick up one or two items here and there because they have just run out or I thought we had some. Now the kids are older, they often come and tell me if something has run out or ask for small items like lead refills for a click pencil that we would never in a million years remember to get when actually at the shops. I also have multiple copies of a printed shopping list hanging inside the pantry. This list is all the items I buy on a weekly basis. When we are actually ready to go to the shops, a quick look down the list to cross off what we don’t need and to add the odd ingredients from the fridge list saves time and means we should get everything we need. http://busycooks.about.com/od/conveniencefoodmixes/Homemade_Convenience_Food_Mixes.htm Other then that, all you have to do is use a cup or so of mixed frozen veg (we use peas, corn and diced carrots) and about a cup of diced cooked meat which I do ahead and keep in the freezer so it’s ready to go. I forgot to mention that we add flavour like sweet chilli sauce or sweet soy sauce etc. after it is cooked. The little ones like it plain but we think it’s a bit bland.